An anthropologist’s moment of truth: This picture is of the first everbfriendly contact with the hostile Sentinelese tribe. Seen here, Madhumala handing over a coconut in person to a man from the Sentinelese tribe. Such are the moments every anthropologist dreams of. This requires years of preparation, persistence, courage, respect for the lesser known people of this earth and of course lots of luck. Some of the world’s most famous anthropologists including Alfred Radcliffe Brown had tried previously for this very moment but failed. On Jan 4, 1991, more than 1200 kms from Indian mainland in the Bay of Bengal, a young Indian women anthropologist waded waist deep on the coral reefs to hand over a coconut to a man from the Sentinelese tribe. This was the first ever friendly contact with this hostile tribe of the Andamans. Perhaps no people on earth remain more genuinely isolated than the Sentinelese, one of the few un-contacted people in the world, who have lived in the North Sentinel Islands of the Andamans for last estimated 60,000 years shunning any contact with the outside world. Their antiquity traced to the Palaeolithic age makes them the first inhabitants of India. There had been many attempts previously to establish contact with the Sentinelese, which however failed with contact parties being received with arrows, some even finding their mark. 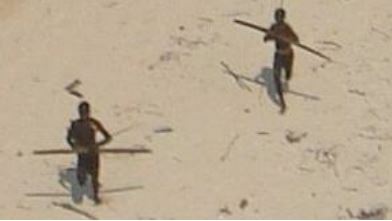 Given the hostile nature of the Sentinelese the contact parties would avoid approaching the tribe directly and watch them from the safety of their ships or leave gifts in remote part of the Island. This was the first time a woman was part of a contact expedition with the Sentinelese and they put their guard down. Presence of a woman indicated that the contact party meant no harm. 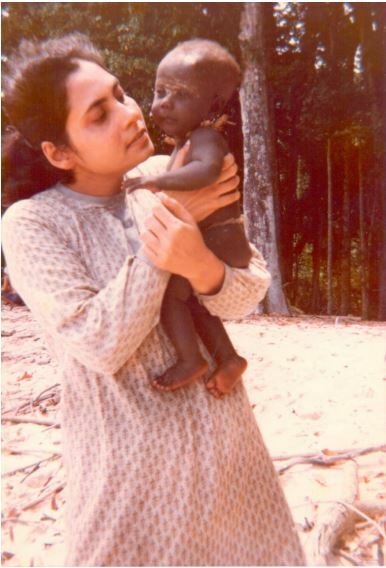 This brave heart anthropologist is Dr. Madhumala Chattopadhyay, then a researcher ( initially a fellow and subsequently research associate) with the Anthropological Survey of India, who went on to spend six years researching the various primitive tribes of the Andaman and Nicobar Islands. Madhumala is also the first woman to be accepted by another Andaman tribe, the Jarawas, with whom she established a friendly relationship, especially with the women folk. Unfortunately her accomplishment remains forgotten. Madhumala now works in the middle level bureaucracy of a Central Government Ministry in Delhi handling routine government files, an unseemly situation for a woman who built our first bridge to an unknown world. Madhumala does not wear her success on her sleeve, and is humble to the point of being reticent. Her book Tribes of Car Nicobar and journal papers remain standard reference texts in universities worldwide. We at Probashionline.com met Madhumala and heard her incredible story. She concluded by saying “Never ever in my six years of doing research alone with the tribes of Andamans did any man ever misbehave with me. The tribes might be primitive in their technological achievements but socially they are far ahead of us”. We could but not agree. A twelve year old girl one morning in her home in Shibpur, Howrah, a suburb of Calcutta, happened to chance upon a small news item in the Telegraph newspaper which informed of the birth of a baby amongst the almost extinct Onge tribes of the Andamans. Excited the girl ran to her father, an accounts officer with the South Eastern Railway, and demanded that on their next vacation they visit the Onges’. Her father in order to brush off his pestering daughter remarked that only a researcher or a journalist is allowed to visit the tribes of the Andamans. This remark stuck and the little girl, Madhumala, was subsumed with the thought of becoming a researcher . The rigour and the hard work of being a field anthropologist – a branch of science which studies primitive tribes, was far from her mind. The romance and adventure of an unknown world beckoned this young girl. After completing her schooling from Bhabani Balika Vidyalaya, Shibpur at the top of her class, Madhumala took admission in BSc (Hons) Anthropology, University of Calcutta. At the University admission counter Madhumala had enquired which department dealt with the study of tribes and was informed it was Anthropology. Back home her parents were a bit disconcerted on their eldest daughter taking up Anthropology. They enquired “what on earth is Anthropology”, to which Madhumala had replied, “this is my passport to the Onges”. Knowing how stubborn and steadfast their daughter could be, her parents did not object despite not being entirely convinced. 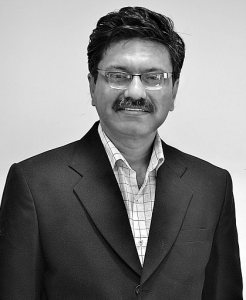 After a brilliant academic track record as an undergraduate and a post graduate student, including a seminal dissertation on “ Genetic Study among the Aborigines of the Andaman“, Madhumala applied for a PhD fellowship to the Anthropological Survey of India for doing field research with the tribes of the Andamans. The committee tasked to decide on the fellowship demurred- the prevalent notion being that it was not safe for a woman researcher to do field work amongst the tribes. However Madhumala’s impeccable academic record, her previous research work and a sterling approach paper for the fellowship was hard to overlook. So a way was proposed by the fellowship committee- Madhumala would be allowed to work in the Andamans on an Anthropological Survey of India fellowship if Madhumala’s parents were to sign an undertaking that if anything untoward happened to their daughter while doing research amongst the primitive tribes including loss of life, Anthropological Survey of India was not to be held responsible. It is to the credit of Madumala’s mother Smt Pronoti Chattopadhyaya ( her father being no more) that she signed the dotted line fully aware of the dangers involved, refusing to let her daughter’s childhood dream go unfulfilled. Little was it known then that Madhumala would go on to create history. The three feet distance between the Jarawa woman and Madhumala in this picture encompasses 60,000 years of timeline – from the early man’s (women’s) hunter gatherer lifestyle to his(her) present forays to the Moon and beyond. Humankind has come a long way. Madhumala for next six years would continue to research the various tribes of the Andamans which had in store many startling events and stories, some of which we will allude to in this article. Let’s fast track to the most seminal work done by Madhumala i.e. the first human contact with the Sentinelese. Perhaps no people on Earth remain more genuinely isolated than the Sentinelese. They till date resist outsiders and are prone to attack. In 1880 a heavily armed British expedtion led by Maurice Portman, landed on North Sentinel and made what is believed to be the first exploration of the island by outsiders. Several days passed before they made contact with any Sentinelese. An elderly couple and four children were captured and brought back to Prot Blair. While the elderly couple died in captivity, the four children were given gifts and released back in the Sentinel Islands, never to be seen again. British did not pursue any further expedition to this Island. Small contact parties sent by the Anrheoplogical Survey of India in the early 1970s were turned away by arrows. A documentary team from the National Geographic accompanied under police protection got the same fierce welcome in 1974. The documentary was interestingly titled “Man in Search of Man”. The film’s director took an 8-foot-long arrow in the thigh. On January 4, 1991, MV Tarmugli, the Andaman Nicobar Administration ship, lay anchor off Allen point on the south west part of the North Sentinel Islands. The purpose was to attempt a friendly contact with the Sentinelese. Not much was expected, probably like many futile missions in the past this probably would also to go down in the file as another wasted attempt. However unlike in the past, this mission had one difference, there was a women anthropologist in the contact team. At around 8 am in the morning the team of 13 including Madhumala set sail for the Island in a small craft. The key team members were Shri S. Awaradi ( Director ,Tribal Welfare, A&NI administration)-Team Leader, Dr Arun Mullick – Medical Officer ( for providing medical attention in case of sickness or injury) and Dr Madhumala Chattopadhyay-Anthropologist. The rest were support crew. As the craft approached the Island three huts came into view. The dreaded Sentinel Island, Madhumala had read so much about was now in front of her. As the boat inched closer to the shore, Madhumala’s heart beat went up a notch – will the tribe show up. However the shore looked deserted. Seeing smoke coming out from another part of the Island, the contact party steered their boat towards that direction. Suddenly Sentinelese were there behind the trees- the most secluded tribe in the world had come to view. Most were men, four being armed with bows and arrows. It was now up to the contact team to take initiative, and they started dropping coconuts in water which they had brought with them. Then something which had never been seen before happened. After a bit of trepidation a few Sentinelese men came sprinting and waded on the shallow continental shelf to collect the floating coconuts. The team was awestruck; the Sentinelese had accepted a friendly gesture. The team leader instructed that more coconuts be dropped and this time the Sentinelese brought a canoe to collect the coconuts in cane baskets. The women and children however maintained a distance and remained on the shore. A invisible wall however stood between the Islanders and the contact team. No party made the first move to bridge the gap further. Four hours rolled by, the contact party kept floating coconuts and the Sentinelese kept collecting them. Perhaps this was the farthest that the Islanders would go. With coconuts over, the team went back to the ship to replenish their stock. It was 2 PM when the team returned. The process of dropping coconuts started and this time the tribe welcomed the contact party with shouts “Nariyali Jaba Jaba”. Madhumala recognised this cry to mean “more and more Coconuts”, a distinct Onge dialect, given her knowledge of a number of Andamanese languages. The Sentinelese in the second round had become bolder. A young Sentinelese youth waded up to the boat and touched it with his hands. Following him more men closed in to collect the coconuts. In this moment of breaking the ice a Sentinelese youth who was sitting on the shore got up and aimed his arrow at the contact party. Fazed but not betraying fear, Madhumala gestured at the youth to come over and take his share of the coconuts. This was a moment of standoff, Madhumala refusing to remove eye contact and the arrow refusing to go down. The arrow was released but Providence intervened. As the marksman was about to be released , a Sentinelese woman standing nearby gave a push to the marksman, and the arrow missed its mark and fell harmlessly in the water. The woman had done that on purpose thus saving the contact party from either severe injury or even death. Undeterred the team persisted. It was now the turn of the Sentinelese to be surprised. The contact party, including Madhumala, decided to jump into water. Knee deep in water, the space age man (woman) was looking eye to eye with one of the most primitive people on earth. It was not a meeting with the finger on the trigger or with a bow string pulled, it was a meeting between equals, with dignity and respect. The coconuts were not being floated in water anymore, but were being handed over in person. This was making of anthropological history. Probably what changed the equation on that fateful day was the presence of a woman in the contact team who maintained her calm and took the initiative. A woman in the contact party indicated to the Sentinelese, who are extremely protective of their women, that the boat people meant no harm. For a brief moment the Sentinalese let their guard down, and allowed outsiders into their world. Madhumala came back to the North Sentinel Islands as member of another contact party on 21 Feb, month and a half of the first contact. This time the welcome was enthusiastic. The Sentinelese climbed up on the boat to receive the coconuts. Thankfully no arrow was aimed this time. While the ice with this hostile tribe was on the verge of being broken, Government of India decided to stop any more contact with the Sentinelese even for academic purposes. It was feared that outside contact might introduce diseases in this tribe. A justified move given the epidemics introduced by outside contact in other tribes of the Andamans. Today Sentinelese remain secluded and hostile despite the early contacts made. The 2011 census of this tribe was done from a distance of 1.5 kms from the sea shore through observation, given the risks involved in sending enumerators ashore. As recent as 2006, two fishermen who had strayed close to the shores of North Sentinel Islands were killed by the Sentinelese. Government of India enforces a 3 miles no entry zone around these Islands. Madhumala continued her research for many more years in the Andamans primarily with the Jarawa tribe. 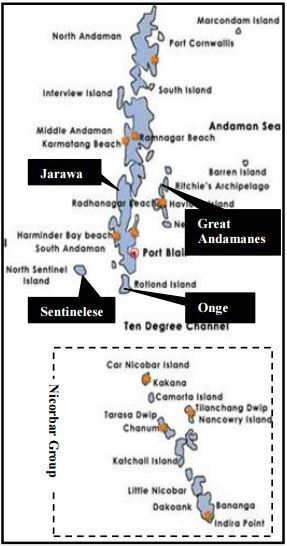 The first friendly contact with the Jarawa’s had been made in 1975 by a joint team from the Anthropological Survey of India and the ANI Administration. Since then systematic contacts were made by administration, who took bananas, coconuts etc as gifts. However there were instances of hostile reactions from the tribe, and authorities had banned inclusion of women in contact parties. In 1991 when Madhumala went; she was the first woman from outside to visit the Jarawas. As a precaution Madhumala remained in the motor boat while the men went ashore to meet the tribe. Seeing Madhumala, the Jarawa women began to gesture her to come ashore with the shout “Milale Chera” (friend come here). They started an impromptu dance to express their joy on seeing a woman in the contact team. This unexpected welcome from the Jarawa women for Madhumala prompted the team leader to send for the boat to bring Madhumala ashore. As the boat neared the shore, five Jarawa men climbed on to the boat and sat across Madhumala looking at her with curiosity. Heart beating hard, Madhumala maintained her composure. Other members of the contact team were not sure how to react; a wrong move could have been disastrous. It was at this juncture that a Jarawa woman climbed onto the boat and sat besides Madhumala. The Jarawa woman gestured to the five men that the visitor like her was a woman. Madhumala at that moment embraced the woman which signified a gesture of friendship. No anthropology text book had taught this, this came from experience, empathy and the sense of self preservation. The Jarawa woman was thrilled at this gesture and made all the five Jarawa men to lie down on the floor of the boat as admonished children. 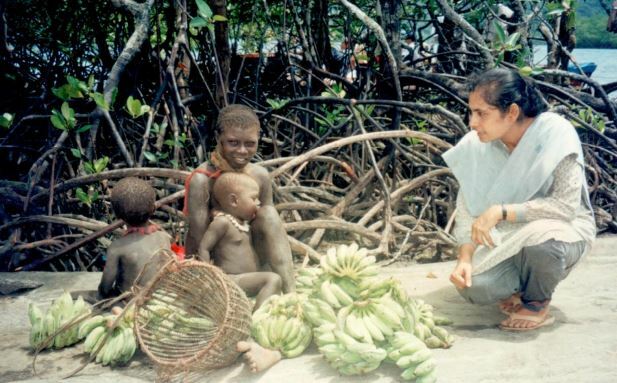 Madhumala with the Jarawa women. Madhumala is the first woman anthropologist who could assimilate with the Jarawas much before the Jarawa came out of their seclusion. Seen in the picture- food being cooked over fire by a Jarawa woman. Jarawas know how to make fire and use the drill method to produce it. On landing , other Jarawa women surrounded Madhumala and started examining her skin texture and long hair with their fingers. The inspection involved pinching and scratching which had to be endured to earn lasting friendship. Satisfied the women offered Madhumala a hair band and a arm amulets as a token of acceptance in the community. Initial initiation ceremony over and Madhumala getting a friendly welcome, she became a regular visitor to the Jarawa territory. 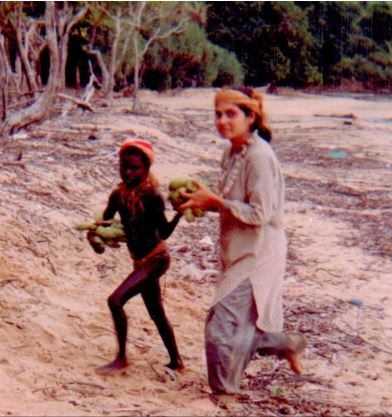 Her anthropological research with the Jarawas was mainly through observation. No sophisticated instruments could be used since the Jarawa had the propensity of claiming things which Madhumala brought as their own, including the pencils which Madhumala used for taking notes. Amongst friends: Madhumala along with a young Jarawa girl helping in the daily chores. The bead necklace around Madhumala’s neck is a gift from the tribe. An interesting bond developed, and the Jarawa women would keep the Jarawa men at bay from Madhumala . She would be invited to the Jarawa huts, play with the children, share their food and sometimes also asked to lend hand with the household chores. Madhumala also became the resident doctor and would apply ointments to the injuries that the Jarawas would get inflicted with during their forays into the jungle for hunting and gathering. Despite her requests the administration refused to give Madhumala permission for night stay with the Jarawas. The visits revealed to to the Jarawas about the modern man (woman) as much as it revealed to Madhumala about the Jarawas. Madhumala also did seminal work with the Onges’ and the Car Nicobarese. Amongst the Onge tribe, Madhumala was known as Debotobeti (doctor), because her anthropological research entailed checking the health status of the Onges including taking of blood samples. Many years later when on request of the Government of India, when Madhumala accompanied the then Secretary for Social Justice and Empowerment, Smt Asha Das, to the Islands, the Nicobarese recognised Madhumala and told the Secretary that their daughter had come back. 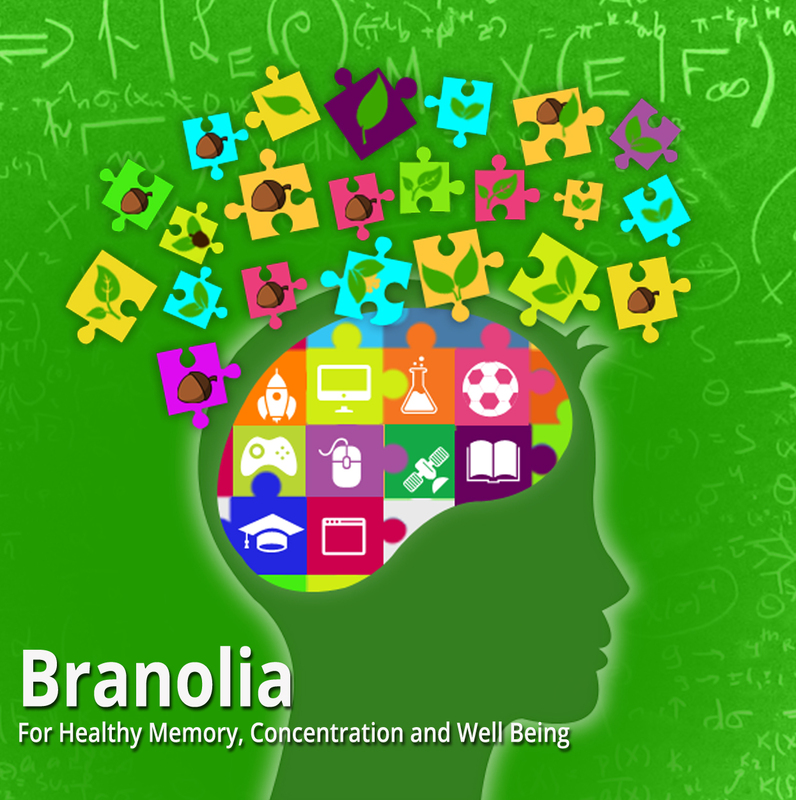 Given her seminal work, universities including University of Cornell and University of California, Berkley offered Madhumala research positions. However her responsibilities towards her two younger siblings and aging mother kept her from taking up these assignments. She took up a regular job with the Ministry of Social Justice and Empowerment, Government of India, where she is now employed as a senior research officer. The government colony in Laxmibai Nagar in New Delhi where she lives is orderly and predictable, far from the verdant surroundings of the Andamans where every turn revealed something new. Her work remains forgotten. Ruth Benedict the famous anthropologist said “the purpose of anthropology is to make the world safe for human differences”. Madhumala has been true to her professional training. Pure inspiration. What a brilliant woman. This is such a great article. Thank you for bringing this out to the public. Thank you for this article. At the time when the American evangelist is claimed to having been killed by the Sentinelese, such articles prove that these people are humans who want their space and dignity. A researcher and true anthropologist can actually make contacts because of love and true spirit. Bravo to her. It was a superb article. Leave them on their own.so called modern man spoiled.all ethnic culture in the name of aid to uplift the trials.their riches and culture has been destroyed in the process as everywhere in the globe. I am entranced by your article including photos of Madhumala and the Sentinelese people. Thank you for sharing this piece about Madhumala. What a story. This was really a beautiful and enlightening article. I wish I could meet Madhumala some day as I would love to hear even more stories from her from her time in the Andamans. Salute to her and kudos to you for telling us all her story so beautifully! What a brave women and thanks for sharing this article. Simply loved reading every bit of this article. The bravery and kindness of Madhumala madam is beyond compare. Hats off to her and many many thanks to the writer for this story. Simply loved reading every bit of this article. The bravery and kindness of Madhumala madam seems to be beyond compare. Hats off to her and many many thanks to the writer for this story. Would that that American fellow had read such articles and studied largely the behaviour of such tribes, he had not dared such expedition and risked his life. A new news. People like Jarwa tribes and Madhubala still live in this planet. Great. Madhubala mam you are great! Lot of thanks for sharing this incredible anthropological article! Excellent article. In view of the recent incident with the sentilenis this article bears relevance. Why the work is not published and not got any media attention..? Why the photographs are not included in the news article, You tube videos and internet!? I thank Probasi and the author for penning down such a wonderful article. My sincere honour and salute goes out to the greatest anthropology Dr. Madhumala Chattopadhyay. It’s nice at least people would now recognise her long lost effort and commendable work she has done. Since the first day I read about Sentinalese in the news and all the articles related, they remind me of the movie AVATAR where similarly there’s a different world trying to stay away and are better than us in every way possible. there is a lot to learn from ancient cultures-and integrate those values into our so called modern culture and way of life.I salute this bold lady fron Bengal.We should visit them to learn and not to teach. Mam i feel you are the bridge between uncivilisation & our so called civilisation which is nothing but harm only. As a bengali person i greet my respect to you. what an investigation. gives goosebumps….and also, hats off to the journalists. an objective yet empathisizing report, so rare in Indian journalism today. This article is very interesting. I could not break reading this. Really appreciate Madhumala for her will power and courage as also for her human approach. Thanks for sharing this article. Wonderful article and incredible work by Dr Madhumala. Came across this piece by accident and found the topic engaging. I would have found it more full in its treatment of the subject had a brief but recent interview between author and subject been included verbatim. Clearly, the editor failed to scrutinize the essay with proper diligence–even for a generalist online magazine. The writer’s style, rather lack of a style, makes for painful reading. There’s too much over the top enthusiasm, troublesome repetition, lack of even a few references to important scientific publications pull back the potential worth of the narrative. Irrespective of offers from the United States, it is not clear why this remarkable anthropologist could not be hired as a faculty member by a university in Kolkata–which would still have allowed her to be near her home base and beloved research field. A pen-pushing job with the government. Given the significance of Dr. Chattopadhyay, the paltry writing spoils much of this essay’s value, at least for this reader. Madhumala got to see and hold that baby she had been dreaming of since she was 12 years old. A magnificent story, thank you. Salute you ma”am. Precious gem. Stunning and ever so inspiring life of a great lady with dream to making them real…a woman gives all for her dreams and gives up too that for her family.. Hats off to you and your team madam. So it was Madhumala or Triloki Nath Pandey to make first friendly contact with Sentilenese? Madhumala was the first women to get access to the Jarawas, and the first person to be able to create a bond with the Jarawa women.